You are here: Home » Featured » Will I Get Time Off in Purgatory If I Take My Kids to Mass? Will I Get Time Off in Purgatory If I Take My Kids to Mass? My husband and I have three young boys (Joey – 5, Nicky – 3, Ritchie – 11 months). These kids are my heart and my favorite people on the planet, but they are the reason that we haven’t heard a homily in five years. When Travis and I were expecting Joey, we were blissfully unaware that all future masses would include spilled sippy cups, leaky diapers and endless interruptions. Here is the normal routine: we get to the church with maybe a minute to spare (because some little guy decides to spill orange juice on his outfit as we’re walking out the door). The boys sit quietly for a long, long time (maybe until the priest reaches the altar). Then they explore the kneelers, hymnals, the purse under the pew in front of us. And then they start talking (“I need to poop, Mommy, Mommy. I NEED TO POOP!”). That is when we take the long walk out to the vestibule. It’s like the green mile, just longer. 1.) Bring toys to distract them. – They will (somehow, some way) make the toy noisy. My boys could make noise with a cotton ball. – They will make a fetching game with the toy, and guess who plays the part of the dog? – See #1, except they will also tear (and sometimes eat) the pages. 3.) Take them to the cry room. – Have you ever been there? In our parish, it’s filled with kids (ages ranging approximately from 7-15) running around in circles swinging their younger siblings above their heads. If you think I’m exaggerating, you apparently have never been in a cry room. – If you want to see or hear Mass, this is not an option. If you don’t care about seeing/hearing the Mass, the cry room is the perfect place. 4.) Tell your little angel to be quiet/sit still. – If you have a young child who listens to you when you ask him/her to be quiet, then why do you need any advice? – Asking a kid (especially a toddler) to sit still is like asking a Democrat to quit spending money. 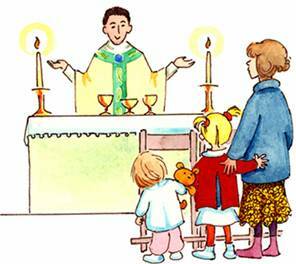 But I still want to bring my boys to church because I want them to grow up remembering that we went to Mass each week as a family, usually with their Nana, Papa and Aunt Mishy as well. Also, I want them to receive the graces that are poured out each time they witness the miracle of the Eucharist. Still, when you’re in the middle of chasing a 1-year-old around the vestibule whisper-yelling sage advice such as, “Stop eating your brother’s shoe,” you might forget why you brought them in the first place. Jennifer Rainey formerly worked as a copywriter and associate producer and is now employed by the three cutest little boys on the planet. She and her terrific husband, Travis, are both Catholic converts and met at RCIA classes in 2004. Do We Take Our Voices to Heaven?